Get in touch through PM if anyone else of the Dutch posse is going to any of these events. Last edited by markus on 12 Sep 2007 11:12, edited 1 time in total. 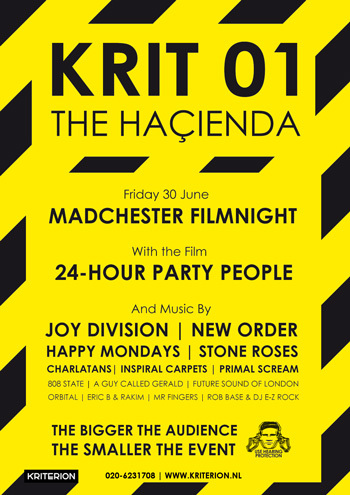 The Madchester filmnight was a bit of a low-key event, about 10 punters in the cinema. The flyer was a lot more professional than the so-called Hacienda do afterwards. Still, good seeing the film on the big screen again. And I did get to meet a bunch of really nice New Order / Manchester-music fans (thanks to my 808 t-shirt). I hope ACR was a bit more of a 'high-key' event?! I enjoyed Kriterion anyway, doesn't happen that much that you actually meet someone who also attended cities-in-the-park. However I was really glad I went, they played for an hour and pretty similar to Paris I guess. It was held in the small room of the Paradiso, so that gave it an intimate feeling which was really nice. Yes, cool to meet someone who attended Cities. By the way, 15 years on, and there are still t-shirts of that gig! The Happy Mondays were on good form last night! Shaun looked a lot fitter (if that's possible) than when I saw him a year ago in Turin. Bez bouncing around and playing with the crowd who probably consisted of a large number of Mancs. No Rowetta, but another black singer who did the job well. If you're interested, for a limited time, I've uploaded all the pictures and films I took here. Also check out the supporting act, ZZZ, the drummer used to be a colleague of mine They are becoming huge - recently opening for Fatboy Slim, Depeche Mode and touring Japan. Would have been nice to see the Hap's again, but couldn't get 1 day off ! Details are emerging of a special mini-tour by Section 25, Crispy Ambulance, Kevin Hewick and other ex-Factory artists. The tour will go under the banner of 'A Factory Night (once again)' and will take place in selected continental European cities in December 2007. Oh dear, according to the Melkweg site, the Amsterdam gig has been cancelled. Anyone know why? Markus, I have no idea. Have to get a refund again then, this is getting a habbit (which I don't like, see www.myspace.com/edmcpike). I hope they come up with a new date. Shame it got cancelled. Could have been a fitting tribute to Tony Wilson. Pob wrote: Shame it got cancelled. Could have been a fitting tribute to Tony Wilson. Sunday - Travel home and fall asleep!